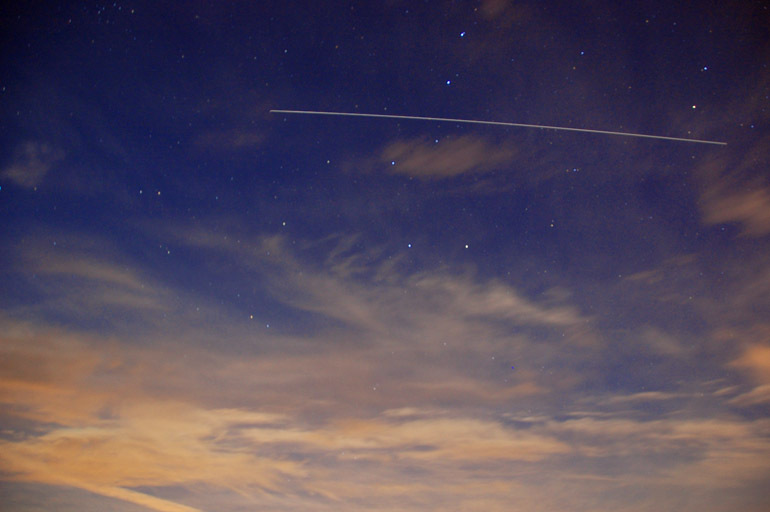 In this first frame, a meteor shot downward just to the left of the space station. It was so faint, however, that I can't really see that the camera picked it up. The space station also is the faintest in this photo, just because I closed the shuttle too soon for fear of overexposing the image. The aperture was nearly wide open. This is looking to the west-southwest. As the station appeared from the cloud cover, it became more visible. It reached a maximum elevation of 48 degrees (it rose from 10 degrees above west-southwest, then descended to 11 degrees above north-northeast when it disappeared). 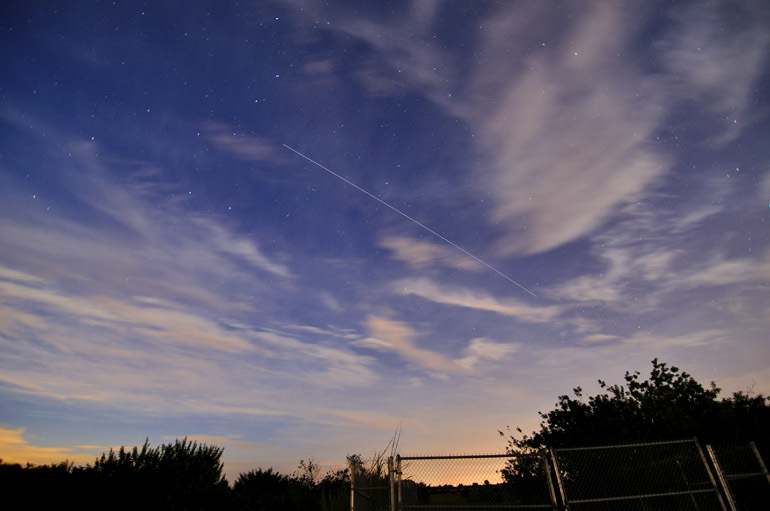 For two weeks, I've been waiting for this week, when the International Space Station was to be visible for up to five minutes several times from Monday through Friday. The lengthy period of its appearance and the reasonable time of day - around 9 p.m. - made it an especially attractive opportunity to see NASA's multibillion-dollar spacecraft fly overhead. It's frequently seen for only a couple of minutes in the early morning hours, about 5 o'clock. NASA publishes the station's periods of visibility on this site about two weeks ahead of time. I often check it, so I was well aware of the upcoming celestial event. Photographing the space station from the ground - with consumer-grade equipment, mind you - is a feat that has been pulled off, but one that frequently results in a boring image. What's so special about a timed exposure with a dark sky and a streak of white across it? I didn't think my own effort, which I attempted for the first time Tuesday night, would result in anything different. But I was wrong. Luckily. Thunderstorms have blanketed Central Florida this week, creating thick cloud cover. 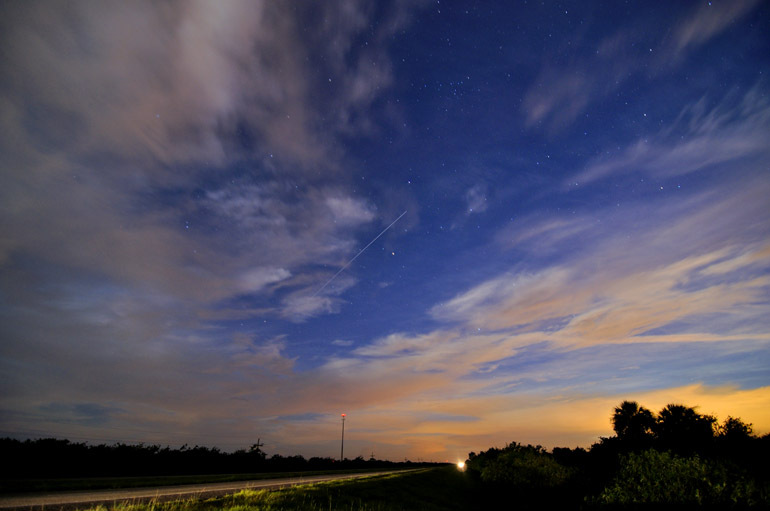 Thinking that would have blocked the space station from eyesight, I gave up on a chance to shoot it Monday. I was wrong, though, and when I walked outside my apartment, I saw the bright star-like object moving across the eastern sky. Unfortunately, I couldn't fetch my equipment in time. So on Tuesday, I was prepared, no matter what. 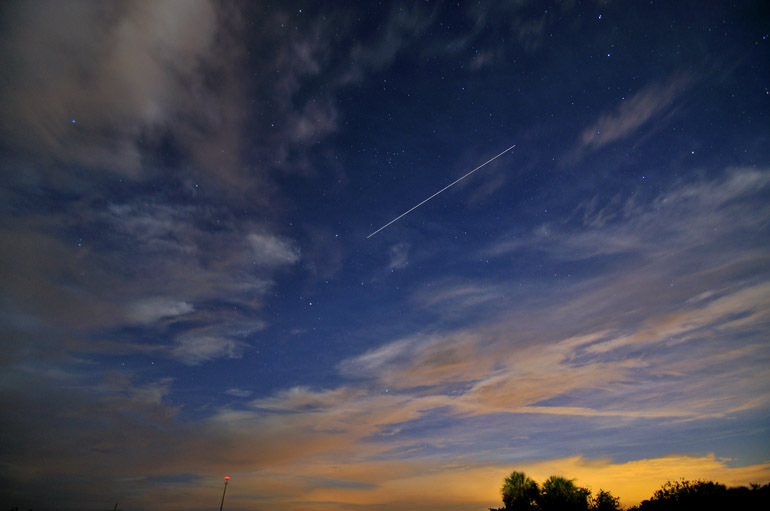 The station's 9:29 p.m. appearance was supposed to begin in the west-southwestern sky and end in the north-northeast. To get far away from the lights of Brevard County's cities, I traveled westward on U.S. 192, which connects Melbourne and Mickey Mouse's home. Out in the middle of nowhere, among the swamps and swarms of mosquitoes, I found a dirt road that was fenced off but offered enough room for my car. It was more than an hour after sunset, but the clouds on the western horizon still glowed slightly with orange. About 10 degrees above the horizon, the point at which the station was to first appear, the sky was mostly clear. It was shaping up to be a little more interesting than just a streak in the dark. I looked down at my cell phone clock. It was 9:29. Where was it? I looked up, and there it was. I opened the shutters on my two cameras, and let them do the work. The photos that turned out the best were taken with my Nikon D90, equipped with a 11mm Tokina lens, which makes the station look kind of small. Maybe I'll try more of a zoom in the future. In hindsight, I should have left the shutter open for a longer span to get a longer streak. Even so, I'm pretty happy with these. For this photo, I followed the space station into the northern sky, and you can see the fence blocking the road in the foreground. I took one shot after this, but the station faded as it again drifted behind the clouds on the horizon. This is one of the shots taken with my D40 backup camera. With the camera's 18mm lens, the streak is a little more visible.